It appeared that no one was responsible for looking after our table. This resulted in a 15 minute wait for drinks and difficulty in flagging down service. Unfortunately this continued all night. The menu was extensive, offering steak, pan-asian curries, noodle dishes and sushi. There is also a live Teppanyaki menu if you are seated at the Teppanyaki station, situated at the far end of the restaurant, where diners are seated around the cooking station and interact with the chefs preparing their meal. We were sitting in the restaurant and therefore ordered from the main evening menu. After much deliberation, due to the large amount on offer, I chose Chicken Tempura as a starter, followed by a Teppanyaki Steak roll which was mushrooms wrapped in beef, served with steamed vegetables and rice. With a strawberry daiquiri to drink, which was nice but overwhelmingly sweet. The chicken tempura was enjoyable but the tempura batter was a bit on the thick side. My main course was presented nicely and the traditional flavours of beef and mushroom, combined nicely with the rice and Asian veg. 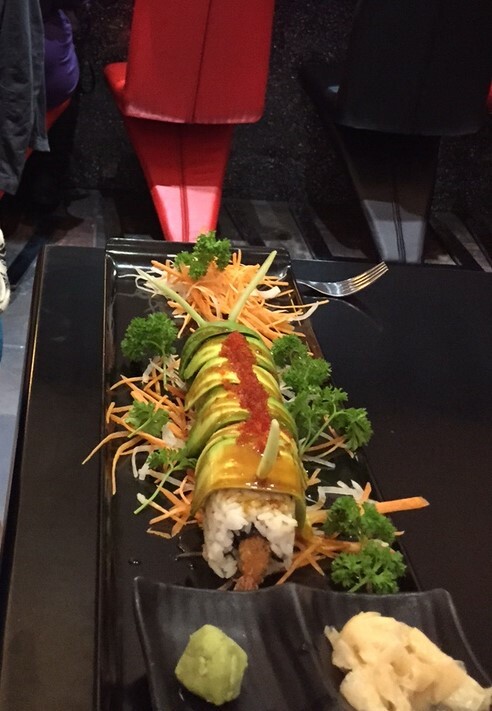 The presentation I was most impressed with though was the Caterpillar 14 piece sushi, ordered by one of our party. The presentation was amazing- it looked like an actual caterpillar. Unfortunately this is a photo from the tail end- not it’s best angle! Service 1/5: The service was really poor and very much let the experience down. We appeared to have no one assigned to our table, which meant that we waited a long time for service. There was a long wait for drinks when we first arrived. It was chaotic and one of the main bugbears for me was that only half of the table had their starter plates cleared, leaving the other half with theirs in front of them which was annoying but what was really bad was that they were then served their main meals and the starter plates were still left there- we had to ask for them to be removed. We also had to wait a long time for our bill to be given to us, after two requests. Food 3.5/5: The food was enjoyable and the presentation was good, in the case of the Caterpillar it was really fun. The tempura batter was too thick which made it quite a heavy starter, and whilst the beef roll was yummy the vegetables were quite wilted. Others at the table found theirs to be a bit bland and agreed with the score of 3.5. Atmosphere 2/5: If you were at the live Teppanyaki table the atmosphere may have been better, but even this looked underwhelming compared to other live Teppanyaki I have seen. However, although busy, I did not particularly like the atmosphere in the main area of the restaurant. The lighting was harsh, giving the impression of a canteen and the extractor fan for the Teppanyaki station was really noisy making it difficult to hear one another. Price £££: The price of 2 courses excluding drinks was around £35 each. Considering the service and the atmosphere, I felt this was overpriced. Overall Score 6.5/15: Disappointing. Hugely let down by the service. May be more atmospheric if sitting at the Live Teppanyakki but I don’t think I will be returning to find out.